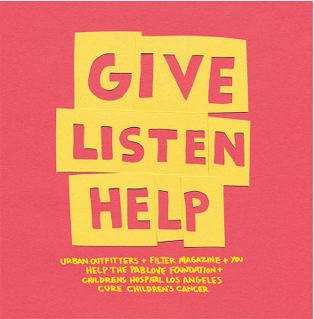 Shirley Manson very graciously took time out of her interview on KROQ last Monday to announce the Pablove Foundation's first public fundraising project—the 'Give Listen Help' CD compilation. Our friends Alan Sartirana and Alan Miller at Filter Magazine/Filter Marketing asked us to participate in this music charity project that they do once a year with Urban Outfitters. You can listen to the Pablove parts of the interview here. The comp is a limited edition, double-disc set, and will be sold exclusively at Urban Outfitters stores. It is filled with unreleased or exclusive tracks (including live versions and remixes). The first disc opens with a brand new Garbage song that was recorded specifically for this release. Other artists who have contributed to the cause include Radiohead, Jack Johnson, Oasis, Bloc Party, CSS, Decemberists, The Faint, Of Montreal and others. Some of these artists are friends of ours, or we are friends with their managers, marketing team, lawyer, etc. Whatever the case, there are 16 artists on the first disc who have given us royalty-free tracks so that we can use their music to beat the hell out of cancer. The second disc includes every artist on Dangerbird Records. This one is all family. These bands have seen Pablo grow up. They've heard him speaking his first group of words. They've looked on as he took his first steps. Pablo's been in the studio with Peter Walker / Eulogies many many times. He was in the studio a few times when Silversun Pickups were recording their album 'Carnavas.' (One funny story is that he hit a MUTE button the mixing desk when no one was looking, and after P and I left, they spent hours trying to fix the 'no sound' problem.) For a few weeks back in 2006, La Rocca had contemplated shooting a black and white portrait of curly-headed Pablo for the cover of their debut album (the idea was nixed cos we all thought it might look too close to the 'Boy' album cover by their Dublin forbears U2). Hrishikesh from The One AM Radio has babysat Pablo, and spent dozens of hours with our family. And with his rifle range ear muffs, he's seen most of the artists on the label play live (I usually take him and Grady to sound checks). I am humbled by the powerful the love and support we've received from our home team. I know that this would be the case no matter who in our large Dangerbird family needed help. It's just the way we roll. We've got each other's backs. The Pablove Foundation will receive every penny after minor manufacturing costs are paid for. More important than the financial aspect, this comp—and all the media attention it brings—will help to raise awareness and consciousness around Childrens Hospital Los Angeles. A big, big deal for us. We are not sure that we can sell the disc on our site—still working on that. Will keep you up to date. MINUTES AWAY FROM GOING HOME! Here is a Google Map Marker. Click for Pablove Foundation Merch!